Mark Pellegrino has teamed up with Attitudes In Reverse® to help start conversations about good mental health and suicide prevention. The best suicide prevention plan is a good mental health awareness program. AIR™ is grateful to Mark for all of his support! Mark Pellegrino met Attitudes In Reverse founders, Tricia and Kurt Baker, at the Supernatural Fandom Movie Premiere in Los Angeles, April 2016. Mark had very recently lost his dear friend, Michael Pettygrove, and Mark offered his help to Attitudes In Reverse. Mark and his wife, and team had previously produced the movie entitled, The Last Train, encouraging people to seek help for depression and other disorders. No one should ever be embarrassed or afraid to seek treatment for a biological brain illness. Mark donated Mike's shoes to Attitudes In Reverse's IN THEIR SHOES™ Exhibit. Mark's quote on those shoes is, "Keep Hope Alive". 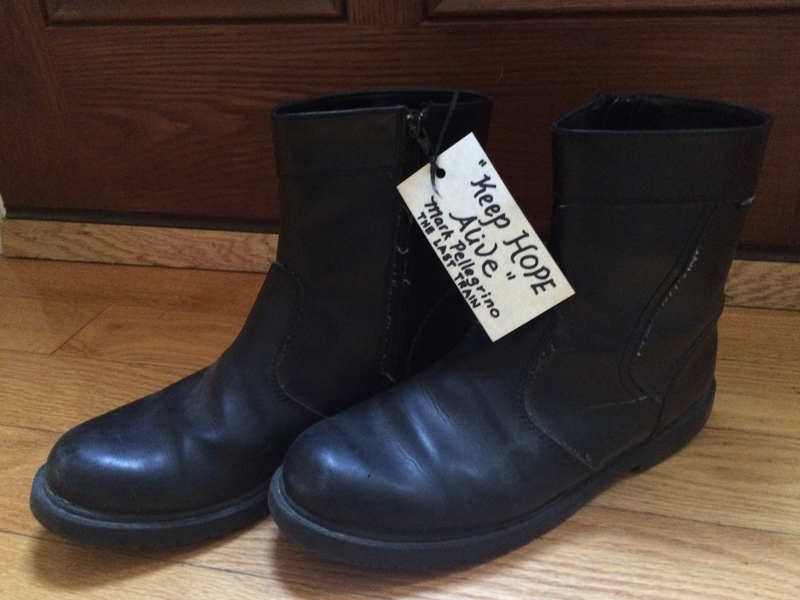 AIR's IN THEIR SHOES™ mission is to educate people to let them know that they are not alone in their thoughts. There are people who care and willing to help. In addition, the IN THEIR SHOES™ exhibit was designed to educate, increase understanding, empathy and kindness towards those who are struggling. Attitudes in Reverse is grateful to Mark's support and caring. Attitudes In Reverse® is a 501c3 non-profit charity. We are all volunteers who believe in the mission of saving lives through education. AIR™ volunteers have educated over 30,000 young people. Thanks to the help of people like Mark Pellegrino, we are able to bring AIRs mission across the United States.